We love talking about Six Sigma ( 6 Sigma) just as much as Jack Welch does. He was the proponent of the business initiative that put GE on top of their market and ensured yearly growth. Since Motorola and AlliedSignal have all had immense success with adopting the system, we’ve developed a short, concise guide for companies who are looking to save their dying company with this tried and tested approach or the business that wants to maintain its position with a solid strategy. Essentially, 6 sigma, companies focus on customer feedback to develop products and then streamline a process that churns out these products with virtually no defects in both the product and the whole customer experience. For Toyota, it’s producing a car that customers are clamouring for with an efficient production line at the right time. 1. They focused on the customer. 2. They made decisions based on facts. 3. They mastered their process and held it in importance above all else. 4. They were proactive in managing every part of the process. 5. They tore down barriers and forts within the organization to promote collaboration. 6. They aimed for perfection but were unafraid of failure and change. 1. It aims for long-term success. Let’s face it, anything that requires this much change and expertise is going to cost you. But in the long run it’s going to help your company survive anything. 2. It creates a clear, over-arching goal that employees can always look up to. When you have a clear goal, your staff always knows what they’re doing and if it’s right for the company. The goal is simple: zero defects. 3. It gives your company more value to the customer. Since you’re working on what the clients want, they’ll be waiting for your products, instead of you having to call out to them. 4. It puts you ahead of the pack. Since you’re tweaking a process and using hard numbers, it’s easier for you to improve and sometimes even faster than other companies. 5. It keeps your staff learning and growing. When your employees level-up, so does your company. 6. Launching new products is easier. 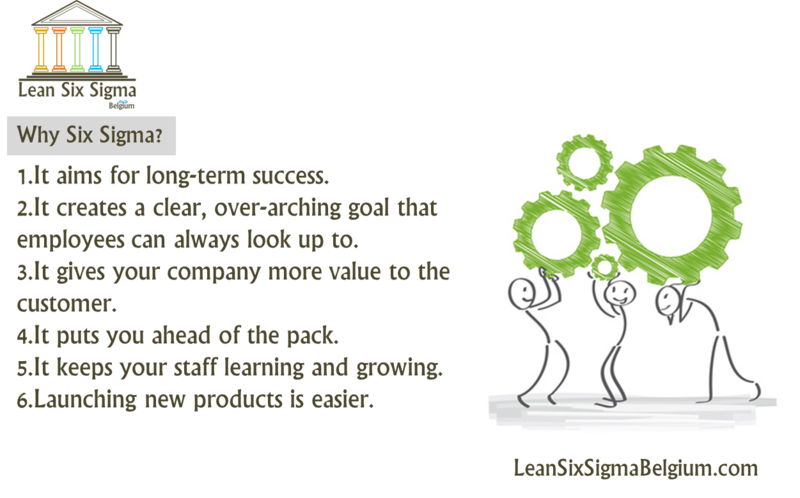 Although launching may disrupt current 6 sigma projects, your employees already know the drill and can adapt quickly. Six Sigma wants your production development to happen in a closed loop so you can contain variation. Although you might think this impedes customer satisfaction and innovation, you must keep in mind that the clients are included in this loop. You always go back to the client wants and needs. You correct mistakes easily since you’ve controlled the variables and you have data to lean on. We already anticipated that you would counter-argue that Total Quality Management is still a better manufacturing guide than 6 Sigma. What we say? TQM does not require clear goals, it is vague and does not rely on data, focuses solely on product quality and is impeded by bureaucratic decision-making layers. Six Sigma does away with all those boundaries by permeating through all business process with hard data, support from the top, success stories and clear strategies and goals. For service firms, 6 Sigma can be a little hard to implement since there isn’t a physical product to tweak. Try looking at the Complete Balanced Scorecard approach that incorporates the relevant 6 Sigma components. Essentially, 6 Sigma is an expensive and transformative initiative to streamline your production line. You have to keep your customer in mind and at the same time your own processes to reduce costs and meet your company goals. What is Lean Management Engineering? What is Lean Management in Insurance? How to Use the Service Balanced Scorecard GLACIER ?